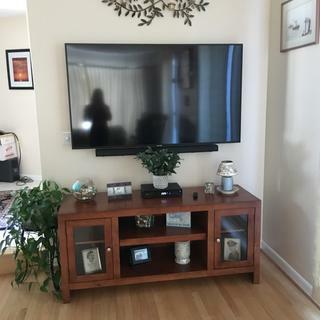 L: 60" x W: 20" x H: 27"
Del Mar 60" TV Console While friends and family may not always agree on the show, one thing's for sure: they'll all love this Del Mar 60" TV console. A beautiful honey maple finish enhances the elegant wood grain. Stunning metal hardware with a rich brushed-aluminum finish completes the elegant look of the TV console. While friends and family may not always agree on the show, one thing's for sure: they'll all love this Del Mar 60" TV console. A beautiful honey maple finish enhances the elegant wood grain. Stunning metal hardware with a rich brushed-aluminum finish completes the elegant look of the TV console. Solidly built and very functional. The depth allows for a soundbar to be placed in front of the television. The console is well made and came completely assembled. It is a very nice addition to our living room. Very nicely handles the 55" TV we had recently purchased. Looks nice. Fits perfect. Good quality. I had to make one hole in the back for wires as they only give you one hole per side. no assembly needed and beautiful.. Very happy.. Built well sturdy piece of furniture. Looks great in our family room. The piece is perfect for what we needed and was affordable as well. BEST ANSWER: Does this item come assembled? Or do you need to assemble it yourself ? WHAT ARE THE DIMENSIONS OF THE BOTTOM OPENING?|WHAT IS THE WIDTH OF THE SIDE SHELVES INSIDE THE DOORS? what is the total height of the center opening without the shelf? can i order an extra center shelf? L: 26.5" W: 18.5" H: 19"
Additional shelves cannot be purchased. What are the dimensions of each shelf for housing CD player Stereo VCR, HEIGHT WIDTH AND DEPTH? BEST ANSWER: The dimensions of the middle open spaces (each) are L: 26" x W: 18" x H: 9". The dimensions for behind cabinet doors (above and below shelves) are L: 15" x W: 17" x H: 9"
What are the dimensions of the cabinets and the center opened shelf? Are the shelves adjustable? BEST ANSWER: The 2 side compartments are each 18 1/4 inches deep by 15 inches wide. The center is 18 1/2 inches deep by 26 1/4 inches wide. Both the side and center compartment shelves are adjustable. Is this item on display at showroom? BEST ANSWER: Yes, it is. We would be happy to check stores in your area. Please contact us at 866-383-4484 option 3. How deep is the cabinet interior? BEST ANSWER: It is 19" deep. After I bought this I wondered why both the product and picture show a hole for wires only in the center open bottom not in the center open and then the picture shows the cable box/DVD player in the center open top which has no hole and shows book in the center open bottom which has a hole ? BEST ANSWER: The manufacturer only put a hole on the bottom in each compartment, however there in an indentation behind the shelf that allows you to pull wires down to the lower section and use the hole in that area. We have over 300 CDs. Is this large enough to contain them and also house our DVD, TV, etc.? or so I need a separate tower? I only have space for 84"
BEST ANSWER: You may need something with a larger amount of storage for your CD collection. Take a look at the Sante Fe 56" console SKU: 364233470, which has a large amount of additional storage below the cabinet. Could I get this console with solid doors instead of glass? BEST ANSWER: I'm sorry. This item is available only with the glass doors as pictured.